But aside from being a handsome fellow with a voice that sends shivers up my spine, he was also an AMAZING, highly underrated actor. For proof, look no further than his role as the mentally challenged sweetheart Charly in the 1968 movie of the same name. The film itself is definitely a heartbreaker. But while the overarching storyline is sad, it's a few poignant scenes and Cliff Robertson's earnest portrayal of Charly that will make your eyes well up. 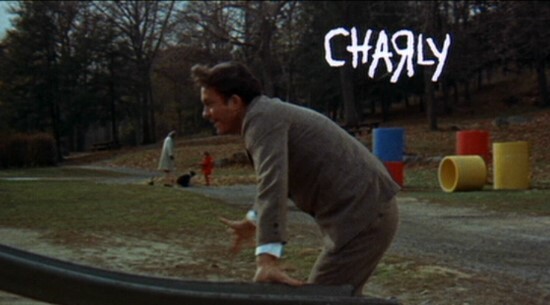 Cliff Robertson does such an outstanding job of portraying Charly throughout all of his mental stages in the film. His progression from innocent childlike wonder to mature, adult understanding is so natural you hardly notice it's happening at first. Even his facial expressions and body movements reflect his current intellect. While I had a very hard time understanding how Geraldine Page was nominated for an Oscar in my last post, I'm not the least bit surprised that Cliff Robertson won best actor for this role. You can get Charly on Amazon here, or it's also on youtube here. I'm also working on a video tribute to Cliff Robertson, so hopefully I'll have that up sometime this weekend. I'm rather embarrassed to admit that I can't think of a single Cliff Robertson film I've seen. I've definitely heard of him, but just haven't had a chance to explore his filmography. It always saddens me a little when I *just* start discovering a star by reading all the memorial posts after his/her passing. But in another sense, I guess it is okay because it helps the memory of that person to live on and be discovered by new fans. This movie sounds really good and I hope I get a chance to see it soon (I have such a long list of "too watch" films!). I'm just worried that I will find it too sad, though, as I can guess how things turn out. I was thinking about it and I actually think I've seen PT-109, but it was a looong time ago. Sorry for the second comment. But after your heartfelt analysis, I feel I need to watch Charly and suffer through the tears just to give Cliff Robertson a chance to show off his incredible skills. Is he the only major character? When I saw he died, I first thought of you Kate! This is a lovely post and I can't wait to see the tribute video. Casey - aww! Maybe follow it up with a happy-movie-chaser! The Moonspinners can wash away your tears!! :) Also I've never seen the Lassie movies either! It's been so long since I've seen it (I watched it when I was a little kid) that I honestly don't remember what I thought of it. I'm really curious now...I guess I should rewatch it! Charly is my favourite performance of Cliff's. He was amazing in that role. And you are right, it's proof that he is underrated. I don't think most actors could have pulled it off. Thanks for this review- I will definitely need to check Charly out.